Wear a hat to prevent condensation from forming on your hearing aid. The holidays can be an especially loud and social time of the year. For those with hearing loss, it can be a particularly stressful time. If this is your first holiday season with a hearing aid device, consider the following tips. Don’t expose hearing aids to extreme temperature changes. 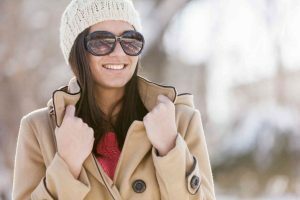 While cold weather is not damaging to hearing aids by itself, condensation can form when you go from the cold outdoors to the warm heated indoors. Condensation build-up can significantly affect your hearing aids. A good idea is to use an umbrella or hat when in the rain and snow. Do store hearing aids in dry places. Using a dehumidifier is a good idea to eliminate moisture build-up on your hearing aid. This is a good investment and a good holiday gift for anyone with hearing aids. Don’t forget to wear your hearing aid during your holiday dinner! No one likes to be the odd one out during a social function. If you’re new to hearing aids, don’t be left out at the dinner table conversation this year. Remember to bring yourself along! Do remind friends and family that you have difficulty hearing. There’s no shame in telling others that you have hearing loss. Discreetly letting your friends and family know will alert them to be more accommodating to your needs. If you know you might have trouble at the dinner table, consider asking to be sat at the middle of the table instead of at the end. Remember, friends may not always know how best to help you unless you let them know. Don’t remove your hearing aids during a plane trip. It’s important to hear essential safety announcements and instructions whenever you’re at the airport or boarding a plane. Plus, you’ll have a much smaller chance of losing your hearing aids if you’re wearing them during the whole trip. Do pack extra batteries, wax guards and tubes. Just like any other essentials, it’s important to pack extra hearing aid supplies. You never know when you’re going to need to change out a battery or the wax guard. Even for shorter trips, it’s best to stay prepared. This entry was posted on Friday, December 2nd, 2016 at 1:59 pm. Both comments and pings are currently closed.